Every industry has its virtuosos, those that take a skill performed by many and add a level of genius and artistic flair that’ll leave you speechless and set them apart from the pack. Somewhere out in the world is a breakfast chef who sends his pancakes into the air performing triple somersaults in the pike position before returning perfectly to the pan. 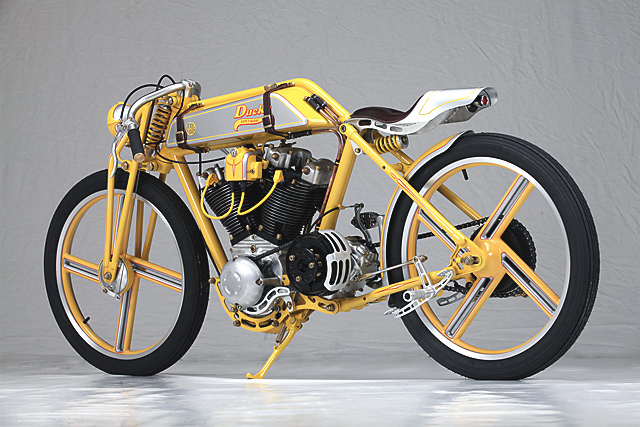 In the bike building world Yuri Shif Customs (or YSC) of Belarus has one such virtuoso in bike building wizard, designer and major show winner, head honcho Yuri Shif. 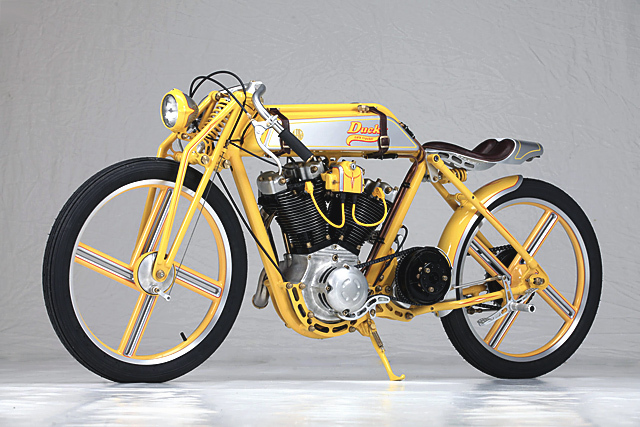 From a man who regularly competes in the AMD World Championship of Custom Bike Building you expect great things and his latest creation, “Ducky” the Cafe Tracker is no exception. 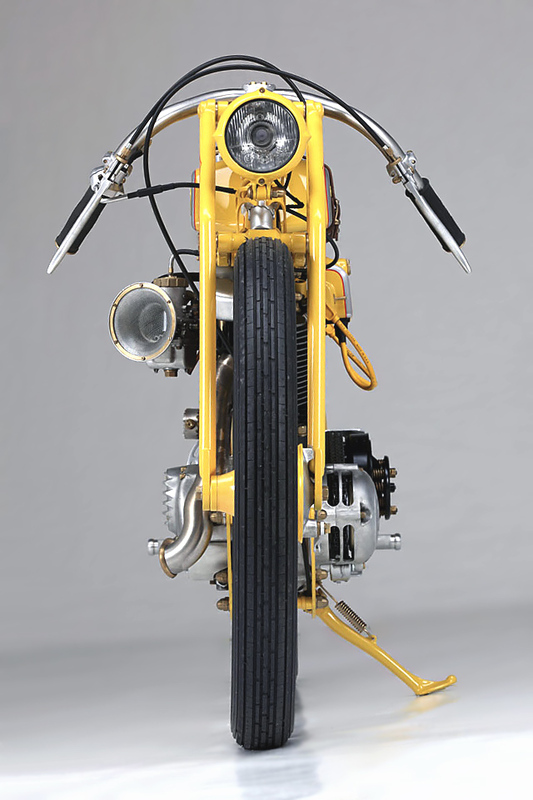 But to bring this bike to life took ten years of mental forethought, thousands of man hours and a desire to create a bike that combined the best of three distinct generations of bike customisation, Board Trackers, Cafe Racers and Modern 21st century design. The result only finished months ago and truly finalised even more recently is so good it’s already won the 2015 European Biker Build-Off and the 2016 Motor Bike Expo in Verona and it all started with the little rubber duck that sits on Yuri’s desk. To get the build going the jig was setup to start the process of building the one-off Board Track frame with mandrel bent steel formed to create the single down tube and back bone resulting in 27 degrees of rake. Which while undoubtedly stunning is somewhat overshadowed by the brilliant single bottom rail with parallel motor mounts also acting as the rear subframe fixture that do away with the need for bulky engine plates and dissipates vibration across the entire frame. The period look girder fork is an incredible combination of machined leading links and round tube that is a perfect tip of the cap to the purists. 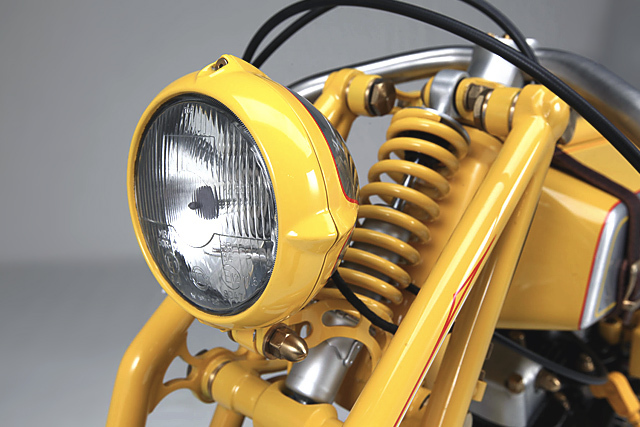 But there is no old shock to chatter your teeth here, instead a modern fully adjustable unit is situated in front of the headstock that allows the bike to remain dive free for a confidence inspiring feel at all speeds. The rear end couldn’t be anything but a rigid but clever use of the top cross-bar allows for a sleek tyre hugging rear fender to be mounted in seamless fashion. This is where the extraordinary metal work begins to really show off the skills at YSC and the tank is as good as they come. Based purely on Yuri’s design it fits meticulously into the frame for a gap free finish but what you cannot tell from the outside is that it’s in fact a two piece unit. Look closely and you’ll notice the Monza style filler on the right and an oil filler at the back left of the tank. But not only is the fuel and oil divided internally to remove the need for an oil tank the front half of the left side houses all of the bikes electronics and wiring, because this show winner also doesn’t mind a trip out onto the street. 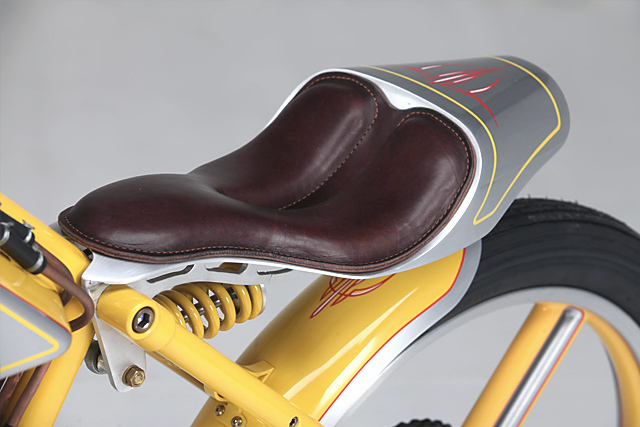 To make those adventures a more enjoyable ride the hand crafted duck-tail seat is sprung with a coilover shock. 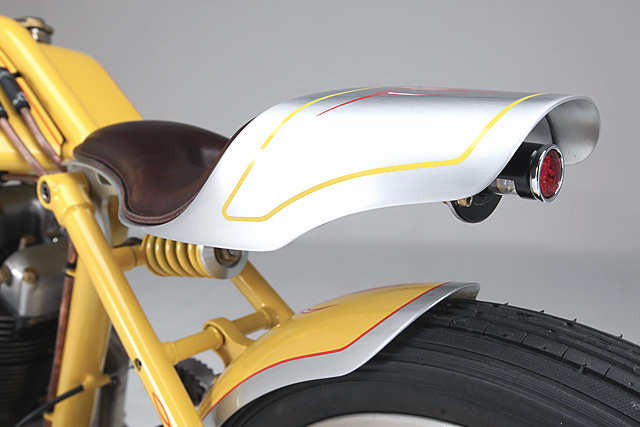 While the seat unit itself is made from the same high-grade leather as the tank straps, stitched and styled in a way befitting the golden age of Board Track racing. Finally before it was all pulled apart for paint Yuri formed an amazing set of bars that are affixed to the single riser coming straight off the steering stem. The paintwork is flawless and like everything else was done in-house at YSC, the solid acrylic look yellow had been on Yuri’s mind from the moment he conceived the build and he wasn’t changing now. To show off his metal working skills the tanks sides and the incredibly formed single piece tail remain unpainted but the yellow hits just about everything else. 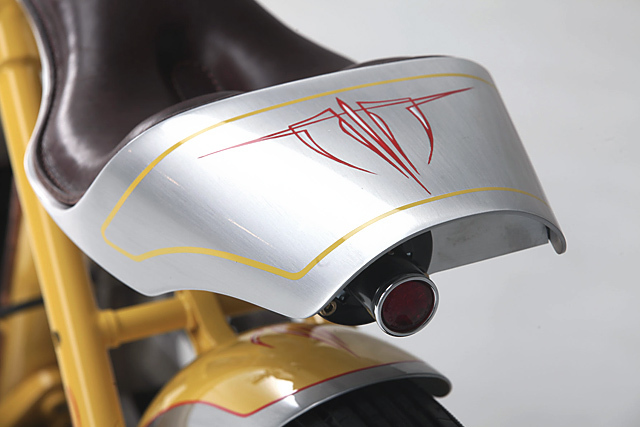 To further break the colour up pinstriping in frame matching yellow, red and white accentuate the lines that would otherwise be lost to the shadows, while the tank wears hand painted Ducky graphics and machined YSC badges. But the genius doesn’t stop there, details impress show judges and while there are no shortage of wheels on the market, Yuri designed and machined his own unique four spoke set from solid aluminium, painted them and then wrapped them in licorice like Avon Speed Master 3.00-21’s front and rear. When it came time to pick the power plant to send Ducky hurtling across the tub Yuri decided to use Harley’s Ironhead engine. Given its three decade production run and simplicity of design it gives classic looks, the ability to add some modern power parts and features the long stroke motors thunderous sound. Internally the 997cc engine from 1978 swings a set of Screaming Eagle slugs pushing and pulling air from a pair of YSC modified heads. The stock Keihin carb has been ditched for a bigger Mikuni 41mm unit mounted on a custom YSC manifold that turns the enormous velocity stack into the on coming air. While over on the other side of the engine Screaming Eagle ignition brings modern reliability with the show spec touch of an almost wire free finish that leaves just the raw metal of the Harley V-Twin on display. 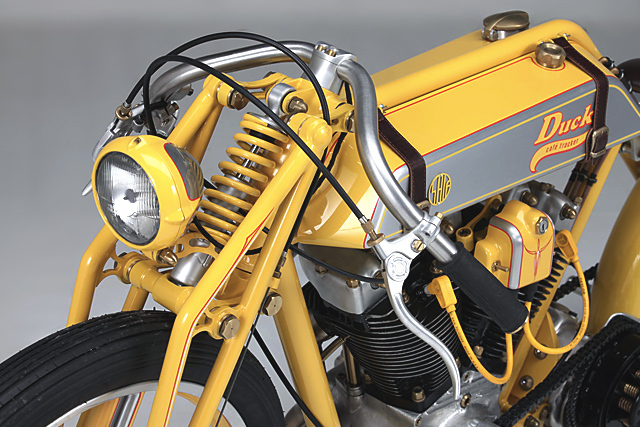 The short block was bolted back together with brass look hardware that is featured across the build, blacked out barrels and raw metal finish to the remainder of the parts for a true vintage look. 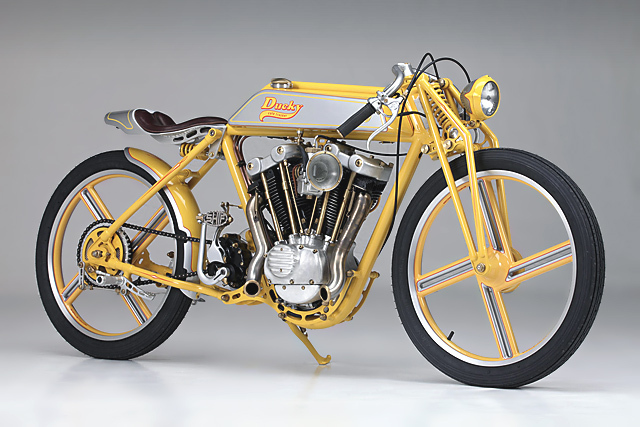 But if there is one freedom a show bike gives it’s the ability to create a set of pipes that doesn’t have to appease the law man and Yuri took full advantage. They are classic Board Tracker items, individual pipes that run from each cylinder with subtle bends that focus the gases out and to the centre, finished off with brass lips on each end. With such a perfect engine, the gearbox had to be just as good and the 1941 WLA unit with open chain primary drive is just the ticket. Making it all work and looking nothing like that army unit it originated from is a combination of Harley and custom-made YSC parts. The clutch itself is vintage HD but actuated by newly fabricated parts with a YSC secondary and sprocket completing the incredible package. Even the functional components on Ducky are a work of art, the rearsets entirely designed and fabricated in-house at YSC could win an industrial design award in their own right. While the kickstarter lets everyone know whose boss, if you want to hear the HD burble you have to stomp on the foot pedal that wears Yuri’s last name crafted from steel. The levers are another YSC creation but what they operate are two of the more subtle yet brilliant design achievements of the build. Creating your own wheels is one thing, but Yuri also built fully functional and hidden drum brakes front and rear for the ultimate in clean styling. For all the show winning, crazy creations, that have come from the mind of Yuri Shif and the YSC workshop it is perhaps his most simple and elegant design that is his finest creation to date and only a virtuoso could achieve such a result with his inspiration coming from a simple toy rubber duck!